Goals are important because they determine how you will measure your success. Goals will give you purpose and outline something for you to work towards. Set goals before developing yourself into a better athlete and improving your jumping ability by deciding exactly what a “better athlete” is to you. First, set short term and long term goals related to your jumping ability. How much would you like to gain each week? How much would you like to gain as a result of using the program? Second, focus your goals on how you wish to apply your improved ability. Do you want to take the “new you” and lead your team in rebounds or points scored, or do you wish to simply make your city league team? When setting your goals, do not hope to achieve the unachievable. For example, do not expect to increase your vertical jump by 35 inches. That is too difficult and unrealistic. It will set you up for failure. On the other hand, do not make your goals easy to reach. Simple goals are not very challenging and will not bring out your true capability. 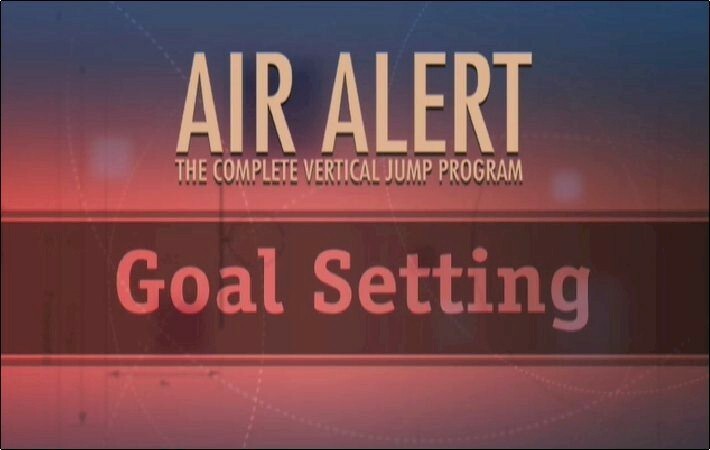 During the next 15 weeks, I plan on following Air Alert® and increasing my vertical jump by ___ inches per week. I will improve my vertical by ___ inches as a result of using Air Alert®. I will accomplish ________________________________________________________ as a result of using Air Alert®.